The Snowwolf 200W Box Mod has been getting a lot of attention for the past few months; a hugely powerful device designed for true cloud chasing enthusiasts. 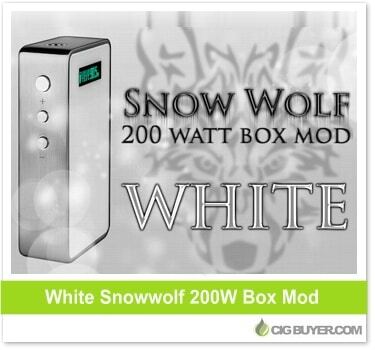 Although it looks great in black, a new white Snowwolf mod is now available at several vendors. It’s exactly the same as the original (with up to 200W of power and temperature control) but with a cool new sleek, white cover. Powered by dual 18650 batteries, it includes OLED screen, magnetic battery cover, spring-loaded 510 and a variety of built-in safety features.